I’m pretty obsessed with caramelized onions. Like, if they weren’t destined for this tart, I probably would have just eaten them with a spoon. This tart is a great option for a holiday appetizer. It’s a nice mix of sweet and savory and warm cheese makes pretty much everyone happy. This was a definite crowd-pleaser. In a medium saucepan over medium heat, melt the butter. Stir in the onion, thyme, sugar, salt, and pepper. Let cook, stirring occasionally, until the onions are caramelized and golden brown, about 20-25 minutes. Remove from the heat and set aside. In a small bowl whisk together the ricotta and egg yolk until smooth. Roll out the puff pastry sheet on a baking sheet and fold in each edge about 1 inch to make a crust. Spread the ricotta mixture over the puff pastry and sprinkle about half of the Parmesan cheese over the ricotta mixture. 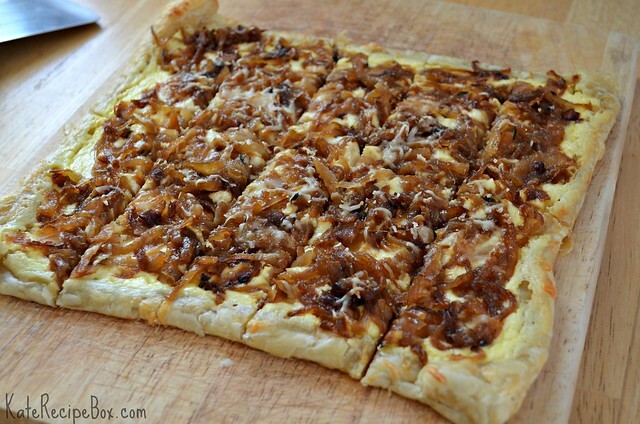 Spread the caramelized onions evenly over the cheese and top with the remaining Parmesan. Bake 25-30 minutes, until the puff pastry is golden. Slice and serve.